Say hello to Chickadee and Baby Bird, two darling 8-week-old kittens. 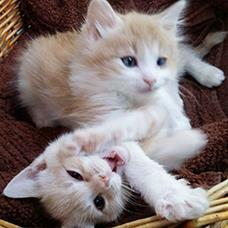 WASHINGTON — Say hello to Chickadee and Baby Bird, two darling 8-week-old kittens. These two fluffy bundles of fur arrived at the Washington Animal Rescue League several weeks ago with their mother, Starling, a gorgeous medium-haired dilute calico.